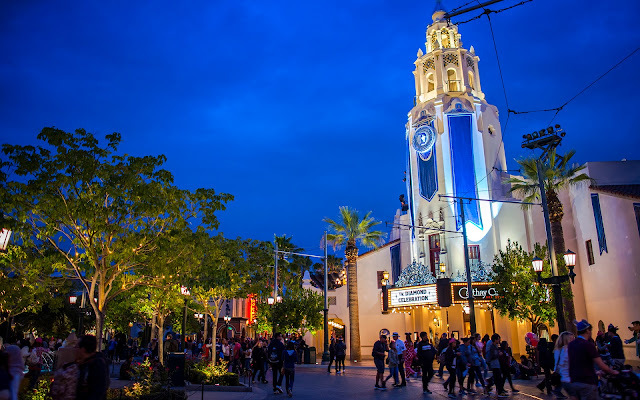 Most of the focus on the Disneyland Diamond Anniversary celebration was fittingly on Disneyland Park, but Disney California Adventure got it into it with a lovely Carthay Circle Restaurant building draped in lovely blue banner, with a beautiful Disney medallion as well. The decoration gave some nice pop to an otherwise clean looking building, and I actually thought it looked rather nice. Perhaps they can do other building decoration from time to time, if it is tastefully done. The 60th Anniversary-decorated Carthay Circle Restaurant provided a nice azure vibe to the Diamond Celebration.